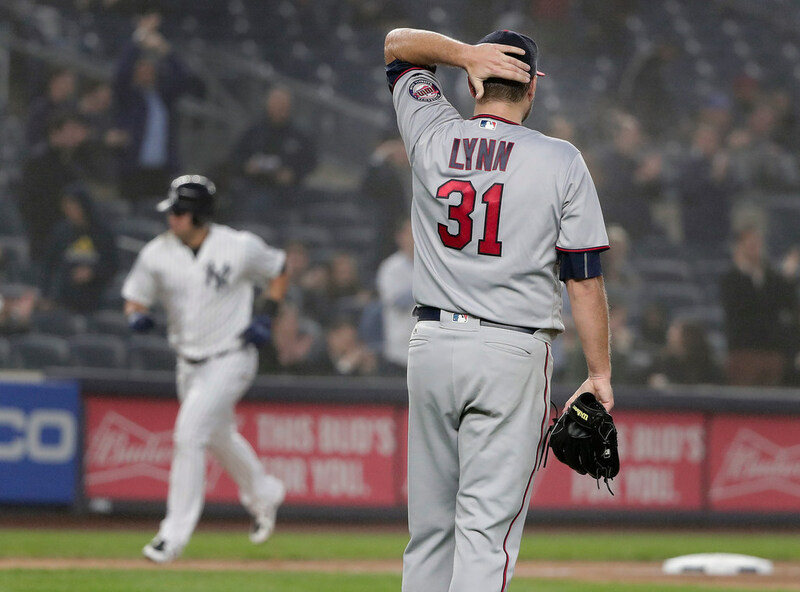 On average, Lynn’s 18 starts in nine-inning games have lasted 3 hours, 18 minutes -- 15 minutes longer than the rest of the Twins' nine-inning games this year. While the average nine-inning MLB game has been reduced by six minutes this season, from 3 hours, 5 minutes a year ago to 2:59 now, Twins games have been exceedingly long. Counting extra-inning games, the average Twins game as of last week had lasted 3:13 — longest in the majors. There are surely several reasons, and it’s not fair to blame just one player. But I will say this: After crunching the numbers, it appears — no surprise — that a lot of the extra time can be attributed to starting pitcher Lance Lynn. Using game-by-game data from Baseball Reference, I took a look at all 18 starts by Lynn this season in non-extra-inning games. Only two of those games finished in fewer than three hours. Three of them lasted at least 3 hours, 40 minutes — three of the six longest nine-innings Twins games this year — and another five lasted at least 3:20. On average, Lynn’s 18 starts in nine-inning games have lasted 3 hours, 18 minutes. And lest you think Lynn is getting picked on for some recency bias and his laborious five-inning, 118-pitch effort in Saturday’s loss against the Royals, that game actually ended in 3:11 and brought his average down. All other Twins pitchers entering Monday have started 69 games that ended in nine innings. Of those games, roughly half have taken more than three hours (36) and half have been under three hours (33). The average time for a non-Lynn nine inning game is 3 hours, 3 minutes – so 15 minutes shorter than his starts, and much closer to that 2:59 league average for a nine-inning game this year. (Parker Hageman astutely points out that Jake Odorizzi has been nearly as bad, checking in at 3 hours, 12 minutes per 9-inning start with some other numbers even worse than Lynn. He should get a share of the blame here as well). If you’re looking for length of game hero on the Twins’ staff, it’s All-Star and Tuesday starter Jose Berrios. The average length of a Berrios start is 2:57 (21 minutes faster than Lynn), and it was even better before his last start, a 3:45 marathon in a 19-6 loss to the Rays in which the bullpen did much of the damage. Eight of the 14 fastest Twins games this season — all 2 hours, 45 minutes or less — have been started by Berrios. All in all, if you have watched every inning of every Twins game this year, you’ve spent 3 hours, 20 minutes more watching nine-inning games started by Lynn than those started by Berrios, even though Berrios has more starts (19 to 18) that fit the bill. Looking for reasons? Start here: Berrios has walked fewer than half (29) as many hitters as Lynn (61) and is averaging 3.74 pitches per hitter — about half a pitch fewer per batter than Lynn, who checks in at 4.22. Those who have watched Twins games – including starts by Berrios and Lynn in particular – won’t be terribly surprised by any of this, but it is rather startling to see the numbers.